Was trying to load Charter.net's ISP antivirus software; was asked to remove the antivirus that came with the Inspiron 14z. In this process the laptop seemingly locked up and was turned off after 30 mins. I get blue screen with "Your PC ran into a problem and needs to restart..."
First time I let this run for 5 hours, finally I shut it down. Every time I powerup now this happens. If this is the case, it is indeed “Intel SRT (Smart Response Technology) Failure Recovery” screen. This screen appears after a forced hard power reset of the computer or a power failure to an Intel SRT enabled computer system. It normally takes a few minutes to successfully 'rebuild' the Cache Metadata. 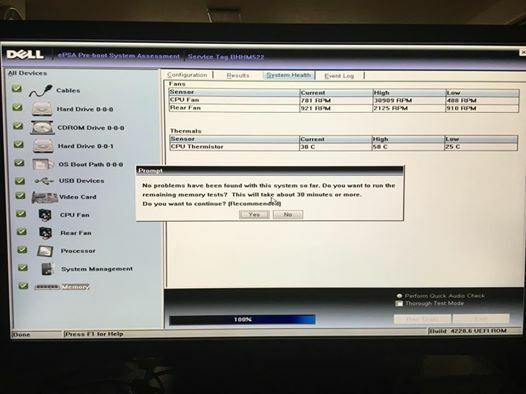 If it is not able to rebuild successfully or is taking more than usual time (which is the scenario you are facing), it is recommended to run a thorough test on all Hardware in the computer with Dell 32-bit Diagnostics. Click here to find steps on how to run Dell 32-bit Diagnostics. If these tests return any error please note them and add the exact text of the error message in your reply. Run “Extended Test” on the machine if any errors are not returned during these tests. I am having the same problem! I have a dell inspiron 15 7520. It is a year old - and warranty has expired. I get the exact flashing screen. I can't get to my bios because it keeps flashing. Can you help me? I have an Inspiron 7520. Windows 7. I get the exact flashing screen. I can't get to my bios because it keeps flashing. Can you help me? I got the same message, "The operating system did not shutdown cleanly. Reconstructing cache metadata," etc. on a new Dell XPS running Windows 10 when resuming from sleep, and even when trying to shut down just after resuming from sleep. This started right after I installed Dragon NaturallySpeaking 12. (DNS refused to start, claiming that it couldn't find a multimedia device, and that I should check to see if there's a sound card or multimedia wave-in component. However, my audio is working fine.) I uninstalled Dragon NaturallySpeaking and the problem disappeared. I'm posting this in case it ever helps someone else who gets the same error message. Look man, there is a super simple way. My brother who is 13 did it. I don't know how but he said all you have to do is get to F12 mode and do something, mess around with it. You'll get it to work. I think you have to go to F12, boot it in a diff mode, then completely refresh your computer dumping all downloads but keeping files then, you should be back to normal. Do what seems right, all this hardware and stuff, they want your money. I bet you this post is going to be deleted or rejected. Hi DELL-ZOHAIB R, I am having the same issue so I followed your direction and found no issues, including with the extended test. Still getting the same screen every time I power up. Any further suggestions? This answer is exactly what i want to get. So I tried and tried your explanation. first, I got F12 and changed boot priority to DVD-ROM. I did "reflesh" and "Restoration". In spite of I did it above successfully, result is same. It still doesn`t work. I spent all day. Is there any other advice for me? I am having the exact same problem on my Dell Inspiron 2350. Running Windows 10 and frequently use the "Sleep" power down function. Things worked totally fine for months. Now, every time I try to resume from sleep I get the "Operating system did not shut down cleanly" error message. 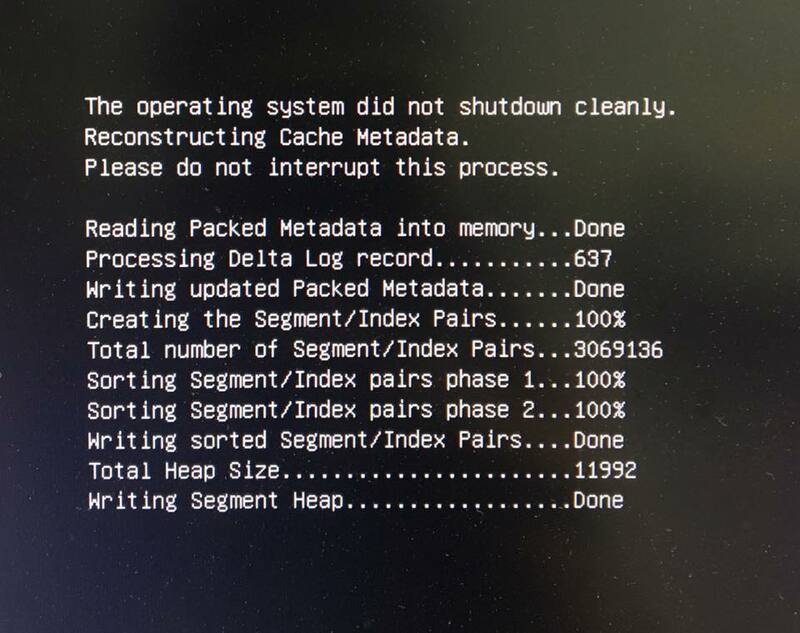 The "Reconstructing Cache Metadata" process is always successful, but this is effectively a reboot of the computer, not a resumption from sleep and takes a while. I have run all of the diagnostic tests in the BIOS (including the extended memory test) and every test passes. Would love suggestions for a solution. I'm having the same problem with an XPS 8700 which is about two years old. It was working fine until about a couple of months ago and this SSD cache rebuilding problem appeared after a full shutdown/restart. Dell sent a new 32GB mSata cache SSD which I've installed and it has not resolved the issue.